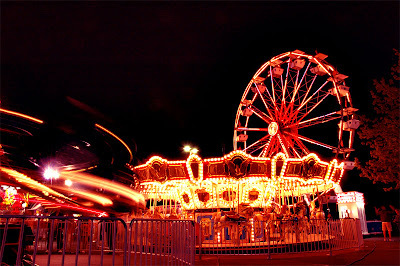 The October Carnival of Pen, Pencil and Paper Approaches! So, I randomly asked Nifty, at Notebook Stories, if I could volunteer for one of the upcoming Carnivals, and it looks like I will be taking October! I know it is short notice, but get your submissions in as soon as you can. 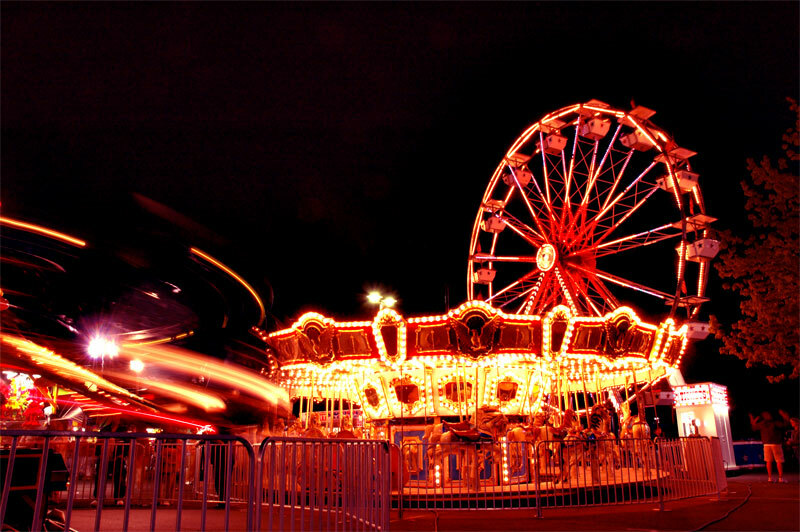 The deadline for submissions is Sunday, October 2nd, and the Carnival will be posted on Tuesday, October 4th. If you have not experienced the Carnival of Pen, Pencil and Paper before, you can find all of the information that you need right here. You are welcome to submit postings from your own blog or any other blog that you recommend. And don't forget to check out my previous posting for your chance to win the current giveaway. I've been hinting at a giveaway in a few of the recent postings, so I think it is time to finally follow through. So, what is included in this giveaway? The Uni Pin .24mm can apparently write on a wide variety of materials, which would be better suited for designing with a variety of mediums or crafts. I like to write, so I don't think I can take full advantage of what this pen has to offer. Next we have the Kum Scribble and Kum Tip Top pencil sharpeners. The Tip Tip was my favorite of the two, and I am not sure about the sharpening Scribble. I had difficulty getting the Scribble to sharpen well, so I am sending it off to let someone else have a crack at it. And the final part of the giveaway is the Daycraft 2012 Signature Diary. 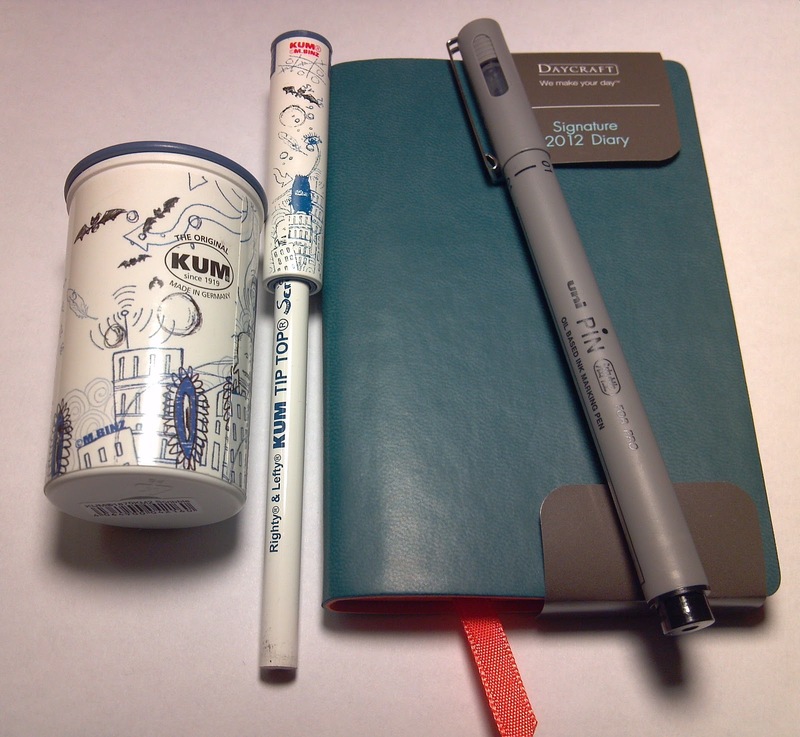 It is more planner than diary, but it is a very cool little planner at that. You must be a public follower of my blog to qualify for the giveaway. Entries will be accepted between now and 11:59pm, September 30th. I must admit, the bright orange barrel pushed me to buy the Pilot Down Force, and the large, industrial-looking clip sealed the deal. Well, let it be a lesson to me, because I was not so thrilled with this one after a few weeks of using it. But before I get into that, allow me to preface this with an introduction to the pen. 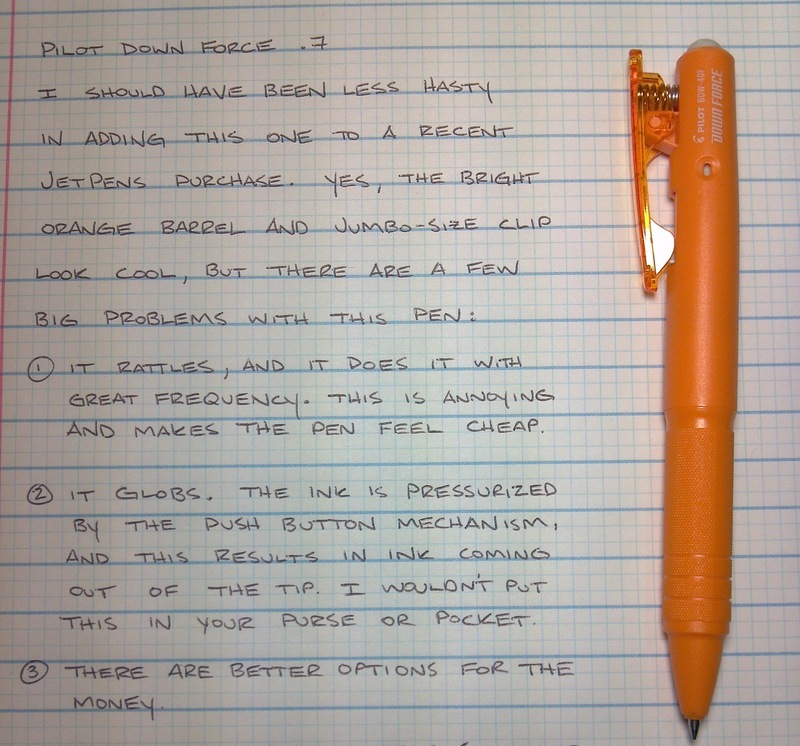 The Pilot Down Force is a relatively new offering on JetPens. Being a fan of premium ballpoint pens, I thought this one looked pretty good. Some of you may have used the Tombow Airpress, and this one works much the same way: the plunger mechanism pressurizes the ink the cartridge, providing a writing experience that is void of any skipping. The packaging also asserts that you can write at any angle, which is great if you are likely to write in such a manner, but I have only ever written at an odd angle when I write down a quick bit of information with a piece of paper being held against the wall or when I am putting up sheet rock or drywall, in which case I am always using a woodcase pencil. In other words, I don't see the need for the write at any angle "feature." You can't really see it in this image, but this pen is prone to globbing at the tip, providing the opportunity for ink to get on just about anything. 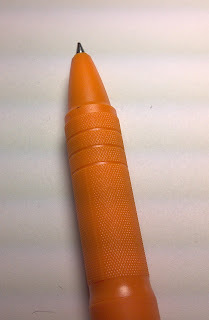 On several occasions I had to wipe ink off of the barrel, my clipboard, and my pen case - very annoying in all cases. The pen also clicks and rattles as I write. Some people don't mind this, but it drives me nuts and seems unnecessary. I also noted that there are better options than this for the same money (or less). 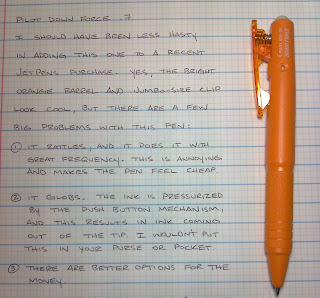 If you want a comfortable, smooth writing ballpoint that has a larger barrel, get a Pilot Dr. Grip. Many stores have these for $6-$8. 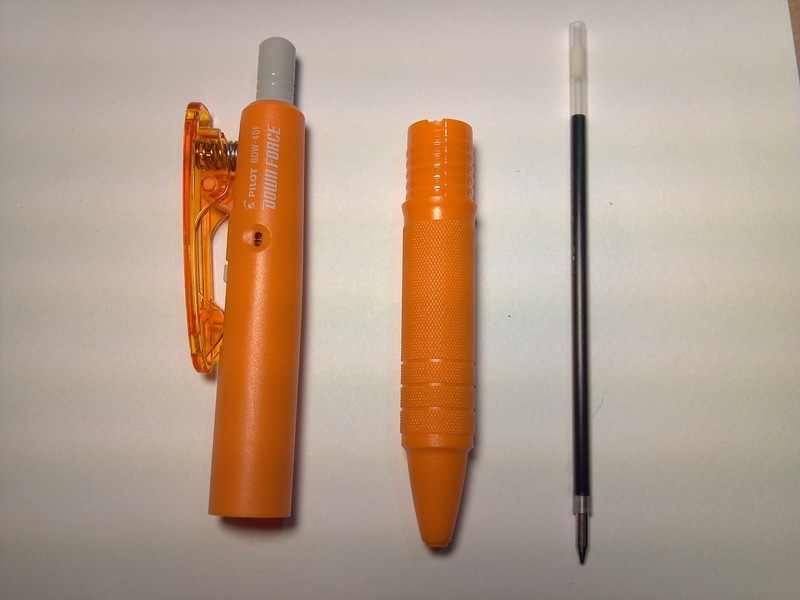 If you want a pen that writes on wet surfaces, in every possible direction and angle, and in very hot or very cold conditions, try a Uniball Power Tank. Both of these options are superior to the Down Force in nearly every way. The refill for the Down Force is the Dr. Grip Multi-pen refill, which means it is going to be smaller than most non-multi-pen refills. Given the size of the barrel, I don't understand why Pilot didn't choose to go with an Acroball or Dr. Grip refill. What I will say is that this could be a good pen for construction, a hospital, or anyone that just loves cool barrels and industrial clips, but I have a hard time justifying this pen over other comparable offerings. 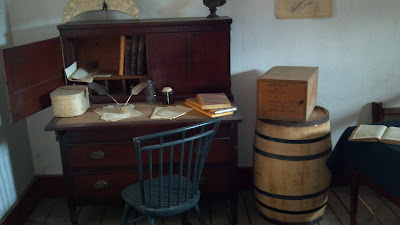 Earlier this summer, I revisited Fort Snelling, a place I had not been to since I was much younger. I didn't appreciate the history of the site during my mandatory field trip (in 1989, I think), but I was enamored with the stories and environments during my recent trip, especially the desks. Though life was once rigorous and rife with hardship, especially in a fort, I cannot help but daydream about the writing experience in that day. 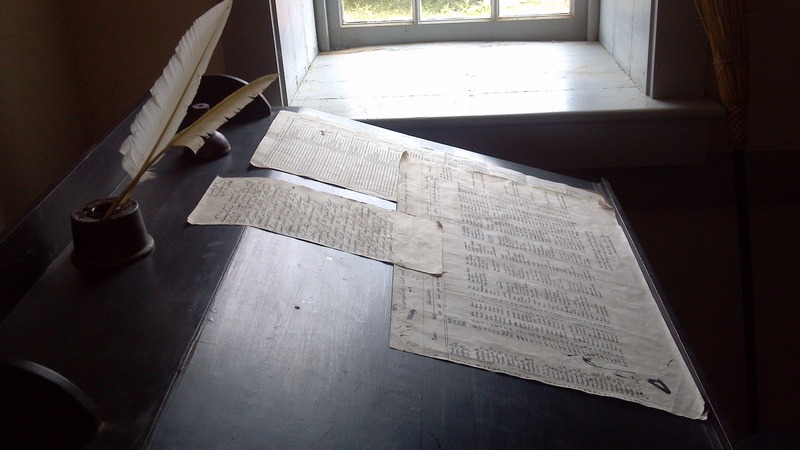 Writing well was a sign of character, and good penmanship was far more significant than it is now. I am working on it, but some of the examples I have seen on the Fountain Pen Network make my jaw drop. The writing box seen in the picture above is a fairly basic design, but I would still love to use one. It is hard to find one these today without spending a small fortune. 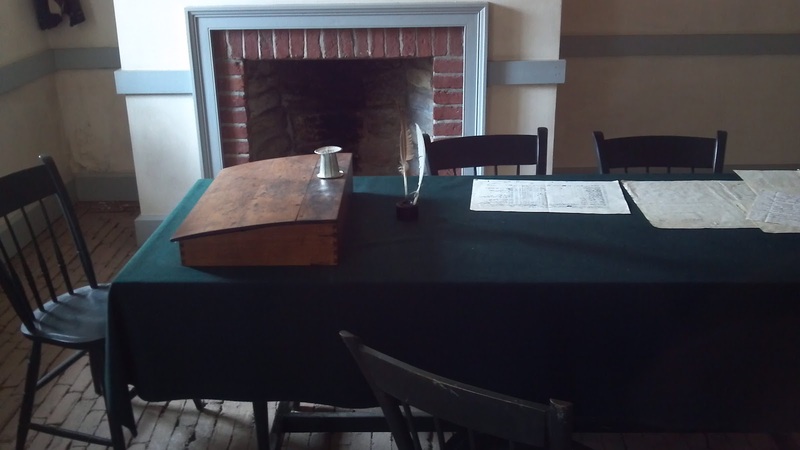 The chair doesn't seem too terribly ergonomic, but this still looks like a great little place to put mind to paper, doesn't it? Fort Snelling has a lot of great things to see, but these three images were by far my favorite.